When you’re ready to find a specific person, use the LinkedIn search engine, with which you can scan the tens of millions of LinkedIn members, based on keywords. The two main ways to search the network are a basic search and an Advanced Search. At the top of every page on LinkedIn is a simple search box, with which you can run a keyword search via the LinkedIn database. This is your go-to tool if you’re searching for a specific name, employees of a particular company, or people with a specific job title. In fact, you’ll get a lot of results with the basic search because you’re searching each LinkedIn member’s entire profile for your keywords, not just one field. If you type Mike Jones in the basic search box (as opposed to searching by the name Mike Jones), you get a more results because you see every profile where the words “Mike” and “Jones” were anywhere in the profile. (When you search by name, LinkedIn searches only everyone’s Name field.) Keep this in mind when you do your search, and pick the method you want based on your goals. From almost any page on LinkedIn, click the Advanced link at the top of the page to bring up the search page. If you’re using LinkedIn Jobs or LinkedIn Groups, clicking this link brings up the Job Search or Groups search page. 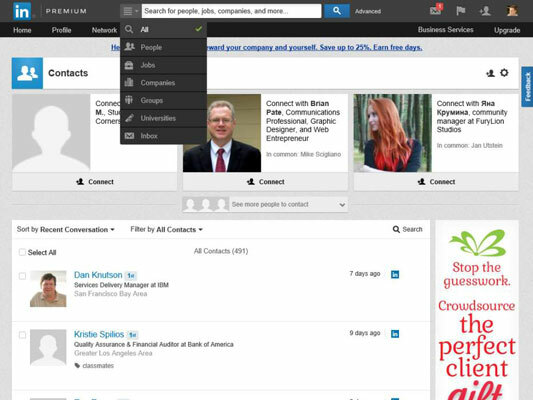 On the Job Search page, for example, there is an Advanced Search link below the job search text box that expands and shows filters for searching jobs. Click the drop-down arrow next to the search box at the top of any LinkedIn page to bring up links to the Advanced searches for People, Jobs, Companies, Groups, Universities, or your messages Inbox. If you download the companion software, you can perform a search from the search box in that software program.